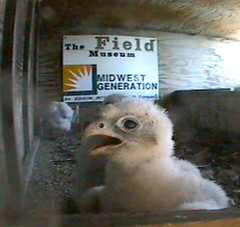 I did not attend the Waukegan banding today, but I have the chick info! Waukegan had four chicks: three girls and one boy. Mary told me that Waukegan decided to go with either Celtic or Gaelic names, so I looked them up and this is what I think they mean. Cara (F, b/r 00/E): This means “dear” or “beloved” in both Celtic and Gaelic. Neala (F, b/r 01/E): This means “champion” in Celtic and “ruler” in Gaelic. Either way, it’s a good name for a peregrine female! Ealga (F, b/r 02/E): This means “noble” in Gaelic. Kevan (M, b/r 10/D): This means “gentle” in Celtic and “handsome” in Gaelic. I bet they were going for the Gaelic translation. This was the first banding, so the score stands: females (3), males (1)! ~ by Steph on May 26, 2009.